Children and senior citizens are commonly thought to have value as sympathetic plaintiffs when it comes to juries. Beware: Axioms that turn up on this page usually meet a cruel statistical fate. Thus, we present the accompanying chart, based on cases reported to VerdictSearch. The results, which reflect winning percentages in jury trials, cast a different light on plaintiffs at either end of age’s spectrum. While adolescent plaintiffs generally win more often than elderly plaintiffs, very young or old plaintiffs are relatively bad bets, statistically speaking. The real sweet spot is between the ages of 20 and 29. After that, it's a steady downhill course through the years. Still not convinced? Check for yourself using the search platform on VerdictSearch.com. HOW TO: Simply the enter the age range you wish to survey, select Verdict-Plaintiff and check the Estimated Results field to see the number of plaintiffs' verdicts for that age group. Then de-select Verdict-Plaintiff and select Verdict-Defendant to see the number of defense verdicts. Feed the numbers into your calculator to determine the win/loss rate. DEEPER DRILL: Filter by gender. 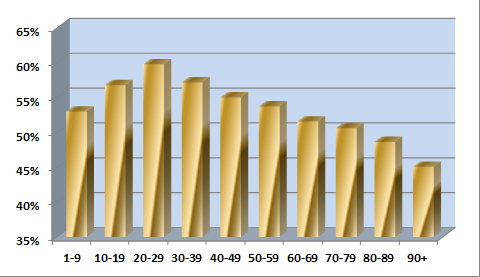 You’ll be surprised to see that gender bias varies according to the plaintiff's age! VS Insights: Check Their Pockets! Screening jurors is a delicate process that involves myriad factors. A trait that makes a juror sympathetic to one plaintiff may very well count against another plaintiff. One fairly consistent trait is economic background. Quite simply, wealthy jurors tend to favor defendants, while low-earning jurors tend to favor plaintiffs. Need specifics? 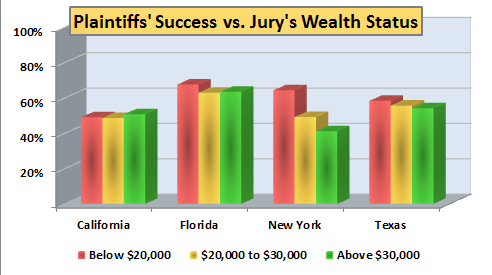 The accompanying chart, based on cases reported to VerdictSearch in California, Florida, New York and Texas, shows that plaintiffs generally have the best chance of winning when their case is heard by jurors from areas in which the average annual per capita income is less than $20,000 (red bars on the accompanying chart). Conversely, defendants fare best in those rarified areas in which the average annual per capita income exceeds $30,000 (green bars). California, where things are nearly even across the board, is the only outlier. HOW TO: This study requires nothing more than the VerdictSearch search platform and an easily obtainable list of per capita income by county. Google will provide the list in two clicks. Once on the search platform, select your state, select the counties, then select Verdict-Plaintiff or Verdict-Defendant to see the total number of plaintiff and defense verdicts for those counties. DEEPER DRILL: You can also calculate win/loss trends in a single county. But rather than a broad win/loss result, filter by plaintiff’s age and/or gender, to see how juries react to different demographics. VS Insights: Cheer up! Smile! Nurse! Medical-malpractice suits are among the most difficult to win for plaintiffs’ attorneys. They must overcome the common belief that medical-malpractice suits are inflating insurance premiums, and the standard-of-care burden is much more imposing than the burden of proof in cases stemming from falls or motor-vehicle accidents, for example. This is all common knowledge. But are all medical-malpractice cases alike? Is a radiologist as likely to win as a dentist? The answer, based on cases reported to VerdictSearch, is no. The accompanying chart demonstrates that orthopedists, chiropractors and physiatrists generally prevail in about 80 percent of cases, but nurses--the doctors’ often-underappreciated assistants--win about 58 percent of the time. Other laggards include gynecologists, obstetricians and plastic surgeons. HOW TO: This one is easy. We’ll run through it for the first category: chiropractors and physiatrists. Log onto VerdictSearch.com’s search platform. In the Type of Case field, unfold the medical-malpractice cases and select Chiropractor and Physical Therapist. Now go to the Award Type field and select Verdict-Plaintiff. 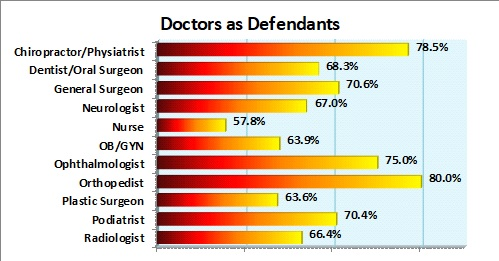 Check the Estimated Results field to see the number of plaintiffs' verdicts for that medical practice group. Now let’s check for defense verdicts for that group. De-select Verdict-Plaintiff and select Verdict-Defendant to see the number of defense verdicts. Some simple math will give you the win/loss rate. WHILE WE’RE ON THE TOPIC: Scroll through the other selections in the medical-malpractice menu to see how attorneys have tried cases with fact patterns similar to yours. Back and neck woes are likely the most commonly cited injuries in personal-injury lawsuits. They’re ubiquitous to the point of being nearly interchangeable, as in “soft-tissue injuries of the back and neck.” But interchangeable they are not, at least in terms of the damages they merit. 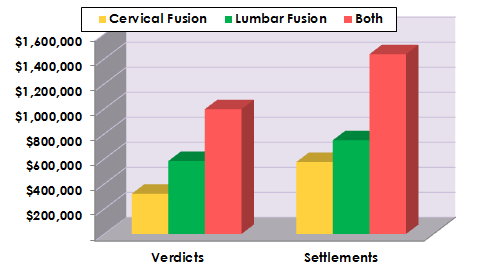 The accompanying chart, based on cases reported to VerdictSearch, compares the median recovery amounts for cases involving fusion of the neck (yellow bars), fusion of the back (green) and both (red). Fusion was used to limit the effect of secondary injuries. Obviously, recoveries are greatest when both the neck and back are fused, but most interesting is that back injuries are worth 30.4 percent more than neck injuries in settlements and 81.5 percent more in verdicts. To study other injuries, use the search platform at VerdictSearch.com. HOW TO: Log onto VerdictSearch.com’s search platform. In the Type of Injury field, unfold the neck injuries and select “fusion, cervical” and “fusion, cervical, two-level”. That isolates all cases in which a plaintiff underwent fusion of the cervical region. Now let’s exclude other types of fusion. In the Search Terms field, enter: NOT “fusion, lumbar” NOT “fusion, thoracic”. Go to Award Type and select Settlement or Verdict-Plaintiff, to filter by result. Click Search, and all of the relevant cases will be displayed. Using the pull-down menu in the upper right corner, sort the cases by amount. The median value is the case for which there is an equal number of cases with greater and lesser recoveries. Congratulations, you’ve determined the median recovery for cases involving cervical fusion without fusion of another region of the spine. ANATOMICAL VARIANCES: The same search can be performed to ascertain differences in other similar but not-so-similar injuries, such as radius fractures versus humerus fractures. So much knowledge to be gleaned!